Journalist intervenes after watching a teenager be harassed on a flight. A stranger on a flight asked a teenage girl for 'dirty photos', then staff intervened. Canadian journalist Joanna Chiu was on an evening stopover. She had a row to herself and was settling in for a sleep, when she noticed something unsettling in the row behind her. A man in his 30s was seated next to a teenage girl who had been separated from her family on the flight. “He was obviously delighted,” wrote Ms Chiu on Twitter. “He started off by asking her about her career plans and laughed when she said she wanted to be a CEO and kept giving her ridiculous advice,” she continued. “She was friendly, and he took that as a welcome queue to get very familiar and started teasing her and kept saying he wanted to take her out to eat, which she ignored,” wrote Ms Chiu. Ms Chiu was starting to get uncomfortable, and deliberately stayed awake to monitor the situation. The man then asked the teenager for a “dirty photo” while leaning in close to her. Ms Chiu describes turning around and ‘rage whispering’ to the man, who got up to go to the bathroom, without responding to her. Another woman seated behind the girl had also been listening, she let the teenager know she had a right to change seats. On the topic of planes, here are 7 annoying habits you should avoid (if you can). Post continues after video. “I went to get a flight attendant and informed her of what was going on. They checked other witness accounts and the head of the flight service (a woman) asked the man to move,” she wrote. The man eventually moved and the teenager wrote up a report with the help of the flight attendants. 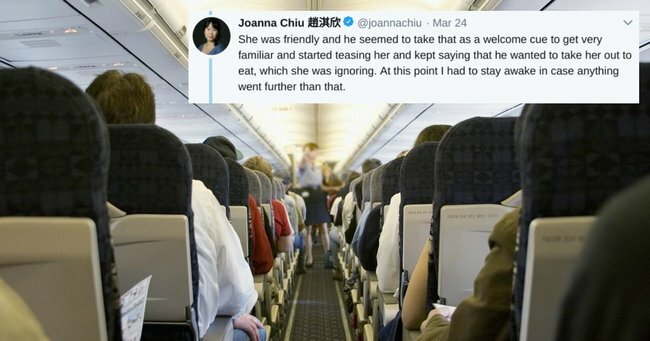 Ms Chiu and the other woman in the row behind were thanked for stepping in and helping the situation, and Ms Chiu noted the airline’s strong handling of the harassment. “It’s sad these experiences are extremely common. All adults need to be on guard and know there are things we can do to intervene even when a crime hadn’t technically been committed yet,” she wrote. She describes two instances from when she was a teenager and similar things occurred – once she was accused by a man of ‘flirting’ on a flight because she was touching the zipper on her jacket. In another instance she was chatting to a fellow flyer and he kissed her without consent. When the flight landed, the man was pulled aside by security and looked like he was “sweating bullets,” noted Ms Chiu. Ms Chiu ended the Twitter thread by stating she planned to contact the man’s place of work, to let them know about his behaviour.